A day out at the seaside was always something to look forward to when I was a youngster. Sometimes it wasn’t possible for my dad to take a whole day off work. So the delights of Blackpool, Southport and North Wales were just a little too far away for us. But, if the weather was fine, there were plenty of places that we could visit and spend a few hours amusing ourselves. Invariably if I had any say in the matter there would be an amusement park involved. I thought I would take a look back at five places that were only a short drive away from my parents' North Staffordshire home. During the 1960s and early 70s it was hard for me to imagine that some of these places would go on to be ground-breaking leisure experiences that thrived while a couple of places would fall by the wayside. As this account is largely based on my own personal memories I have stronger recollections of some places than I do others. While I would usually get to visit Alton Towers each year, either with family or on school trips, my visits to the late and much lamented Belle Vue Zoo could be counted on the fingers of one hand. Looking back it also seems strange that, apart from the Manchester complex, I always thought these places were far inferior to the seaside amusement parks of the day. I’m not sure if it ironic, or just sad, that while three of these places are now booming many of those seaside counterparts are no more than rubble. This is not intended to be a comprehensive history of any of the parks but more my own personal recollections. If anybody had told me as a child that Alton Towers could turn into one of the most well known theme parks in the UK I would have given them a slightly strange look. For starters, anybody who has visited the park would tell you it’s not exactly the easiest of places to visit. 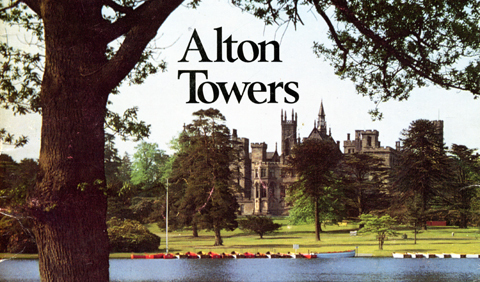 I remember my dad driving through the wooded twisting roads to Alton and my brother and me trying to be the first one to spot the gothic towers hidden behind the trees. In those days you could park your car on the grass which looked over the lake towards the ruined towers. One of the first attractions you came across was the sea lion pool. I seem to remember there was one particular sea lion that had a habit of spitting on visitors if they got a little too close for comfort. If it was a warm day you could dip your feet in the paddling pool or enjoy a slow paced donkey ride. There was also a boating lake where you could hire out rowing boats. Walking over to the woods you would come to two of the park’s most popular attractions. There was a railway which travelled through the woods to the Chinese Temple. 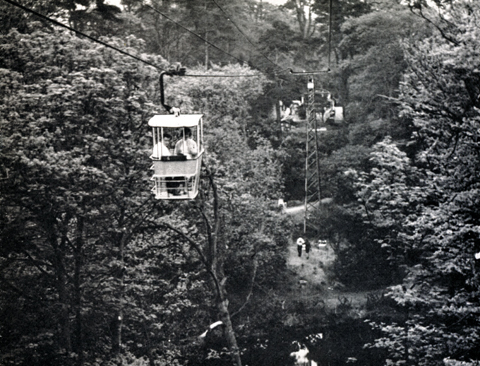 In 1961 this was joined by a more thrilling attraction - an Ariel Chairlift. This had four seater cars which were open to the elements. When you had travelled up the initial incline you would be at the same height as the tree tops. I always recall that you got a real feeling of tranquility as you glided above the woodland. Usually you would get out at the Chinese temple and walk down into the magnificent valley gardens. Although this aspect of the park was something that was lost on me. As a child there was only one place I wanted to visit - the amusement park. 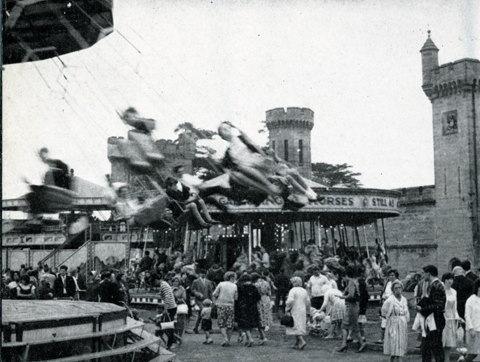 The amusements had an unusual location as they were in the grounds of the ruined towers - today this is known as Cloud Cuckoo Land. The park was operated by Brian Collins - a member of the famous showland dynasty. 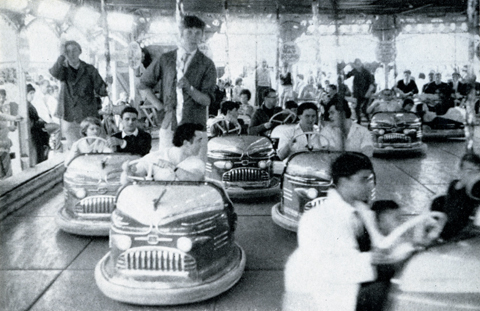 The majority of the rides would be considered very tame by today’s generation who take hi-tech spinners for granted. The first ride on offer was a three abreast set of Gallopers - the horses were named after members of the Collins family. It had started life as a set of Dobby Horses built in 1897 but converted into a set of Gallopers in the early 20th century. Next to this was a small set of swing boats. At the far end of the amusement park was a set of adult chair-o-planes. Opposite this ride and housed in a large building was a Fun House. 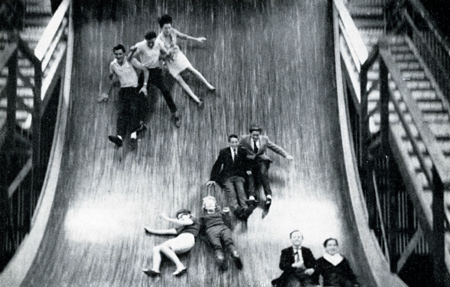 This had all the usual devices in it like the joy wheel, moving floorboards and in the centre a vertical drop death slide. You could stay in the Fun House for as long as you wanted. I was never brave enough to try the slide although this was to be joined by some other less scary slides in the park a few years later. Back outside there was on ornate set of dodgems. These had been manufactured by Orton and Spooner and had very distinctive Fleur-de-lys rounding boards. I also remember the smell of carbon and sparks flying when the dodgem poles made contact with the nets that transmitted the power to the cars. Probably the most unusual ride was the Razzle Dazzle. This was very much the forerunner to the Trabant or Satellite rides of the 1960s. This ride dated back to the early 20th century and was the very first fairground ride to incorporate tilting and spinning. I think the Collins’ had made a couple of attempts at modernizing the ride and renaming it the Flying Saucer. 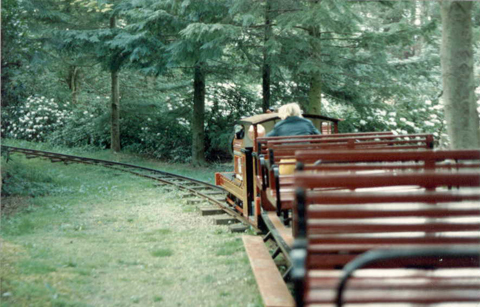 But when I visited Alton Towers it was called the Alpine Tippler and had alpine scenes painted on its boards. If you want to see this ride today it forms part of the Hollycombe Collection in Hampshire. It is the only example of this ride left in the world. But if you are thinking of visiting to see the Razzle Dazzle please check first as it was being renovated in 2011 season so not operational. 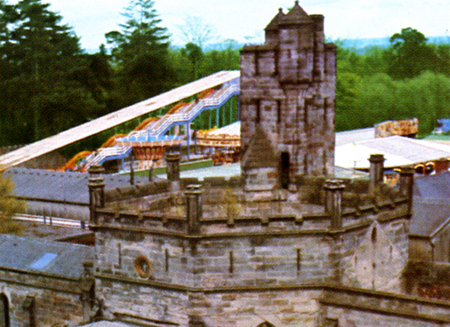 Alton Towers also had a few children’s rides. There was a toy set roundabout, a Peter Pan Railway where individual trains traversed a track - this was very popular in the 60s and most parks had one. The final children’s ride was the Happy Caterpillar. Manufactured by Maxwells the main car’s wheel axles were not central which caused it to bounce as it travelled in a circle. I think The Fairground Heritage Trust in Devon has just purchased one of these rides. The amusement park was completed by a few stalls and an amusement arcade in a wooden building. Unless it was the main season I don’t think the amusements opened at the same time as rest of the park. I remember going on a school trip and being gutted as we had to leave at 2pm and the funfair didn’t open until then. I’m not sure what year exactly but the Razzle Dazzle left and was replaced by a Lighthouse Helter Skelter. 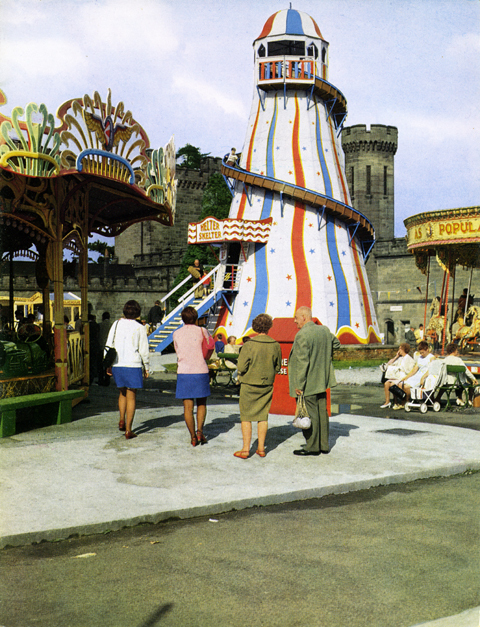 In the early 70s another slide - the Astroglide - was built up adjacent to the tower walls. It ended up with a roof over the top so it could still be operated on rainy days. There was very little change at the park in the 70s apart from when a well decorated Ghost Train was added to the attractions and the Lighthouse Helter Skelter departed for pastures new. 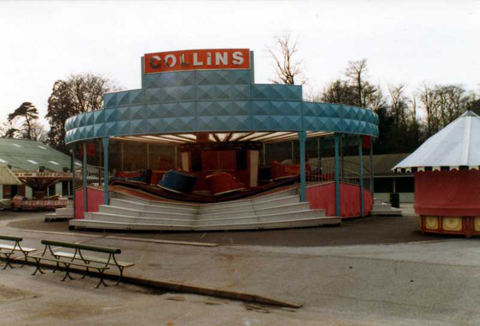 For some reason, and I’m not sure why, it was all change in 1979 at Alton Towers as the Collins decided to get rid of a lot of the older rides. 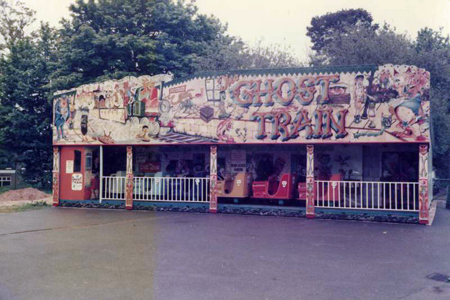 The Ghost Train, Fun House and Astroglide remained but the Dodgems, Gallopers and Chair-o-planes were all removed. They were replaced by a very modern, if somewhat plain looking, Maxwell manufactured Waltzer which had block colour impregnated fibreglass rounding boards. The base colour of the machine was pale pink and the rounding boards and pillars were sky blue, the ceiling was transparent fibreglass. The second addition was a Water Chute. This had been manufactured by Ivan Bennett of Ilkeston. It was quite a small structure compared to the rides at Belle Vue and Porthcawl. It also differed in that it had a train rather than individual carriages. This was the only such ride ever manufactured by Ivan Bennett. The revamped park was short-lived as John Broome had his mind set on turning Alton Towers into the UK’s first theme park. The following year he introduced the Corkscrew and Pirate Ship. I visited to see what all the fuss was about regarding the new coaster. While the Astroglide had been incorporated into the theme park the rest of the amusements lay, looking forlorn, behind a boarded fence. It wasn’t long before the Water Chute moved to the seafront at Southport for a few years, where it ended up being scrapped. You can still see the Waltzer today, albeit looking somewhat different, on Clacton Pier. 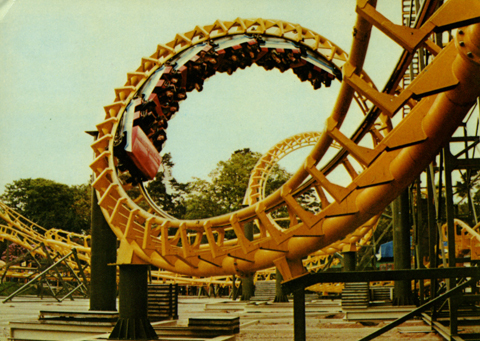 As for Alton Towers…..I think everybody knows how that story goes.